While I always knew that the commercial skincare and hair care products that we use contain harmful chemicals, I never bothered to check the ingredients (haw!) because as long as they were not harming my skin, all was forgiven and forgotten (quite literally lol). But little did I know that our bloodstream absorbs 70% of the things that we put on our skin within seconds....WHOA! It was after reading through certain green beauty blogs, I realised the amount of chemicals I am putting on my skin. I slowly began to chuck commercial products out of my stash and replaced them with products from commercially available brands that marketed their products as natural and herbal, while they contained toxins. Here in India and even Pakistan, we have little or no awareness when it comes to green beauty because the commercially available brands have been misleading us for many years and we do not bother to go through the ingredients list. While browsing through the aisles in stores, we literally pick up anything that attracts our eyes without caring a hoot about the damage we will be doing to ourselves in the long run. I delved deeper and began to learn about ingredients, beyond the usual ones - parabens, SLS, SLES etc which was an eye opener. Sadly in India and Pakistan, we do not have any regulatory bodies as opposed to USA or European countries that ban harmful chemicals being used personal care products. It took me a whole year to transition to clean beauty but it has been one heck of a journey. It has been more than 30 months since I ditched commercially available personal care products and I find my facial skin, hair, and body skin in a better condition now. They neither harm your skin nor your health. They are environment-friendly as well. Animals are not harmed while making them. They can be customised according to your needs. 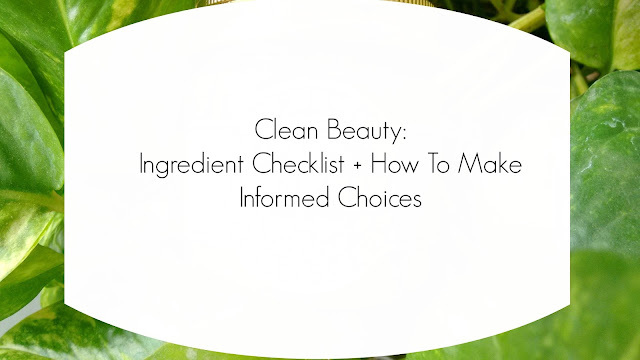 Switching to clean beauty can be really confusing and I for one would not recommend ditching commercial junk in one go. Instead, the journey could be started with making smaller changes, as in instead of purchasing commercial face scrubs, face masks, and hair masks begin by whipping your own products with the ingredients that are easily available in your kitchen. While doing so, you are in control of what you are putting on your skin or hair. You could gradually start buy products from green beauty brands in small quantities and see what works for you and what does not. Do not hesitate in sharing your concerns with the brand while choosing the products. Trust me when I say this, majority of the brand owners are super sweet and cooperative. They will patiently tend to all your queries and questions. To find brands that make non-toxic personal care products in India and Pakistan alike, please read through the blog and you will surely find something that will catch your fancy. In order to educate yourself about the ingredients, before purchasing any commercial personal care product, make it a point to check the ingredients list - you will find yourself struggling in the quest to pronounce half the names. It has happened to me when I had started out on my clean beauty journey back in 2014. If you are interested in learning more about the ingredients, I would recommend this article. Another great resource is this one. Let's make 2017 a year where we would minimise the use of toxic chemicals and find solutions to our skincare and hair care woes in nature's lap.